"False id" started a new series of exhibitions entitled “Search on matter”, organized by the Benaki Museum Shop at Piraeus annex. "...The artist’s starting point is the paper shopping bag, a symbol of our consumer lifestyle. This mass produced and disposable paper bag is at it’s best finally recycled. 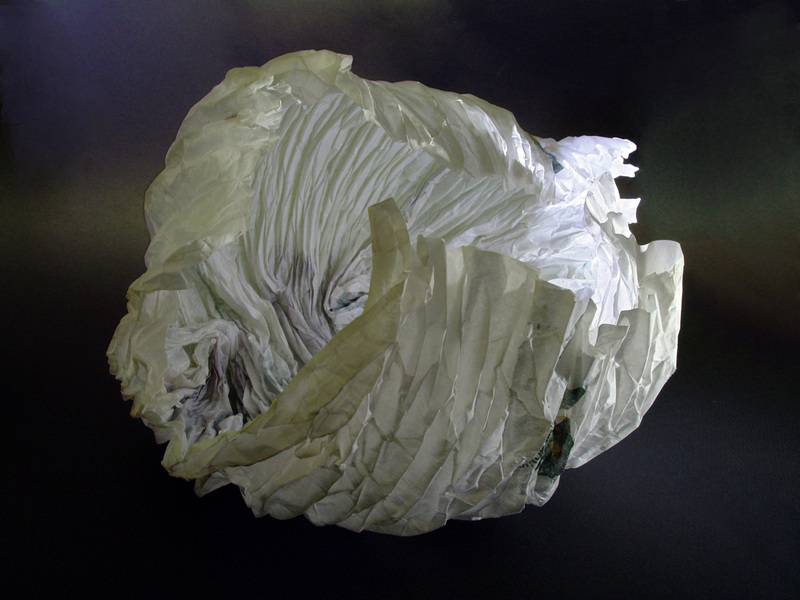 In order to "rescue" paper and restore its former value, Gremouti reconstructs the bag. 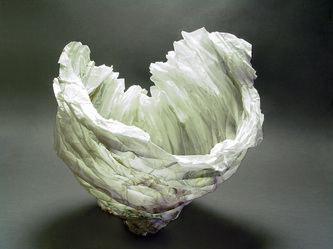 By combining paper and fabric folding techniques, she converts the flat piece of paper into a three - dimensional work without cutting or pasting it. The integrity of the original material is thus preserved. The artist has created paper vessels, drawing parallels between the current paper bag - container and the vase - pot - container of antiquity. The works explore the boundaries between tradition and technology, mass production and art. Through a game of identity they negotiate the relationship between useless - useful - usable, and ultimately the affinity of the terms: art, design and craft." , from the exhibition's press release." " The fact that the paper shopping bag is an object that does not keep its original identity, an easily obtainable but short lived social symbol that creates images and at the end of the day cancels its own; that something nice and desirable is in a very short time converted into an object of low value made from mass produced materials, is the core of Georgia Gremouti's creative process. With her work she comments on the issue of differentiation between utilitarian, decorative and fine art objects." "To the paperfolder, the square is the origin of all form. Geometric shapes, animals, objects and human beings arise from the square and then, unfolded, dissolve back into it. The empty square is the alpha, the genesis and the prime mover of origami. In Taoist philosophy, the square is the First Form, the undifferentiated void from which the opposing Yin and Yan forces arise." "Cheap and versatile, the blank slate of paper offers a great starting point for the appreciation of uncharted terrain, aesthetic exercises and experimentation. At the same time, this exploration of physical space, of the confines of their medium's idiosyncratic strengths and weaknesses, marks a return to straightforward skills, to objects - and moments - that tickle our senses, to things we can touch, see, smell and manipulate with our hands for close encounters and immediate sensory feedback. Unscreened by a screen from the reality that surrounds us, the results encourage direct interaction."